Med sine 7 stk. 4-in-1 LED dioder, der både har rød, grøn, blå og hvid, kan man lave endnu flere lyse farvenuancer end med traditionel RGB. Se den i vores udstilling, hvis ikonet "på lager" vises på varen. 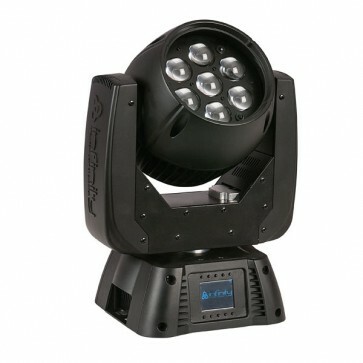 The Infinity® iW-720 is equipped with seven, 20W, quad color RGBW LEDs and offers seamless zoom from 7° to 50°. 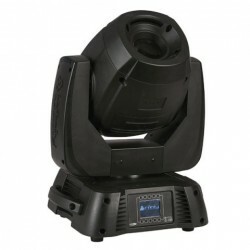 Another significant key feature is the segment control of the LEDs these are divided into 4 sections which can be controlled individually offering the user endless creative possibilities. High speed motors for pan and tilt movement are used for accurate and very fast movements. Multiple dimming curves can be selected by the GUI where both, halogen modes or quick dimming can be achieved. 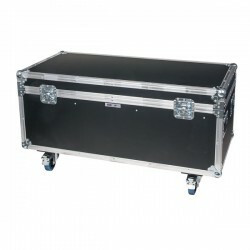 Dimming and strobe are microprocessor controlled, ensuring smooth 0-100% dimming as well high speed 0-20Hz strobe effects.